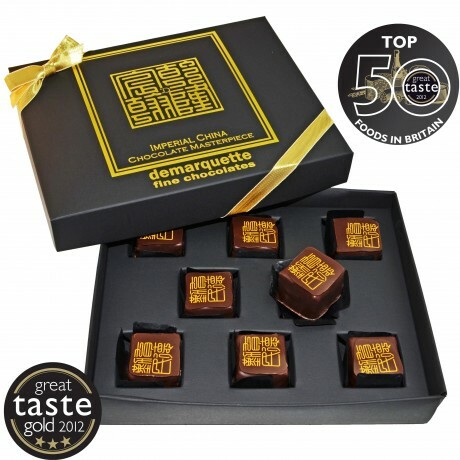 Awarded a triple Gold Star at the 2012 Great Taste Awards and nominated as one of The Top 50 Foods in Britain today, these are truly spectacular chocolates. Hand crafted with the finest Vietnamese, Malagasy and Venezuelan cacaos, and blended with White Monkey Jasmine Tea, using chocolatier Marc Demarquette's unique methodolgy of volumising ganache to optimise the flavour. The result is a light and delicate flavour of cocoa with subtle notes of Jasmine, with a chocolate couverture layer to add texture and stronger cocoa tones for an exciting and delightful chocolate experience. Box contains 8 Imperial China Chocolates. Due to the fresh ingredients used these chocolates should be consumed within two weeks of purchase. Ganache: Dark Chocolate, Milk Chocolate, Cream (MILK), Butter (MILK), Honey. Dark Chocolate: Min 71% Cacao Solids, Cacao Butter, Sugar, Emulsifier: SOYA Lecithin, Natural Flavouring: May include Mint, Green Tea, Black Tea, Coffee, Spices, Orange, Lemon, Lemongrass, Jasmine, Rose, Coconut, Passion Fruit, Raspberry, Peach, Vanilla, Whisky, White Wine, Ginger, Basil, Cacao Powder. Milk Chocolate: Min 35 % Cacao Solids, Cacao Butter, Dehydrated MILK Solids Min 25% , Sugar, Emulsifier: SOYA Lecithin,Colourings: E171, E129, E102, E110, E132, E142. Colours may cause adverse effects in Children. Contains dairy, may contain nuts. I was disappointed that the box wasn't the same as in the picture. It was a plain black one rather than the picture of the boat. Such a shame as the box in the picture is beautiful. I just hope the chocolates make up for the disappointment. Salted Caramel Chocolate Gift Box "World of Salt"
There are Salted Caramels and then there are these. There are Salted Caramels and then there are these. Certainly delivers on the visual hand painted chocolates and then the incredible caramel centre. You certainly get value for money, I can't imagine how much time it takes to prepare these considering how quickly we enjoyed these! Utterly stunning. The flavour profile is incredible, real fresh jasmine and soft smooth chocoalte! Worth every single penny and certainly reserved for very special occasions. The ultimate standard in the artisan production of luxury, hand-made fine chocolates.